Visage blinds can also be motorised with the Louvolite One Touch motor or the Somfy Battery Motor, enabling adjustment of privacy levels at the touch of a button. Vision Duo Rollers are a stunning alternative to standard Voile blinds and curtains. The unique 'DUO' layer of fabric allows the blind to be extremely versatile. In the open position the fabric allows a view through the translucent part of the fabric. 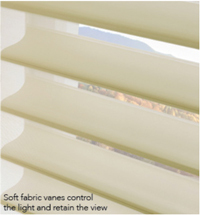 When set to the closed position the opaque bands line up and give the privacy and shading of a standard roller fabric. The sidewinder action allows the blind to be rolled up as normal into the stylish headbox. An elegant contemporary 'Rolling' bottom bar completes the look of this unusual and innovative product. If you would like to know more about this exciting new product and its availability you can call us on 0113 2557637, or email us here. Louvolite 2017. Another great collection, which has again managed to bring something exciting and fresh to the table. Books are available now and will include this year the Roller/Vertical combi @ £90.00, Vision Book @ £37.50, Visage Book @ £30.00 and Pleated Book @ £60.00. A new Contract Book is also available @ £28.00. Contact Sales on 0113 2557637 or email us at here.